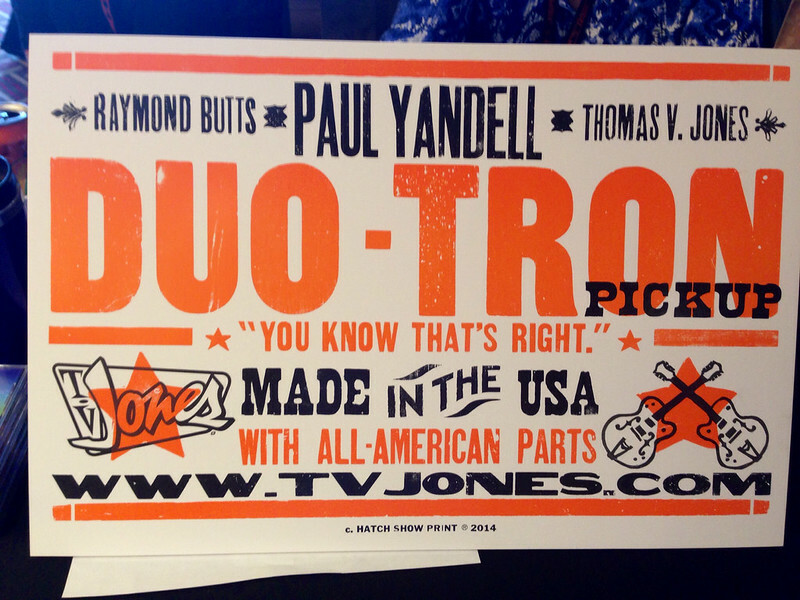 I was walking around the vendor booth this afternoon, and saw that TV Jones is making the Paul Yandall designed Duo-Tron pickups now. He said they are brand new. They look great. On the neck pickup, the pole pieces are under the bass strings, and the bars under the treble. On the bridge pickup, this is reversed. They come in two finishes....chrome, and a sand blasted finish. 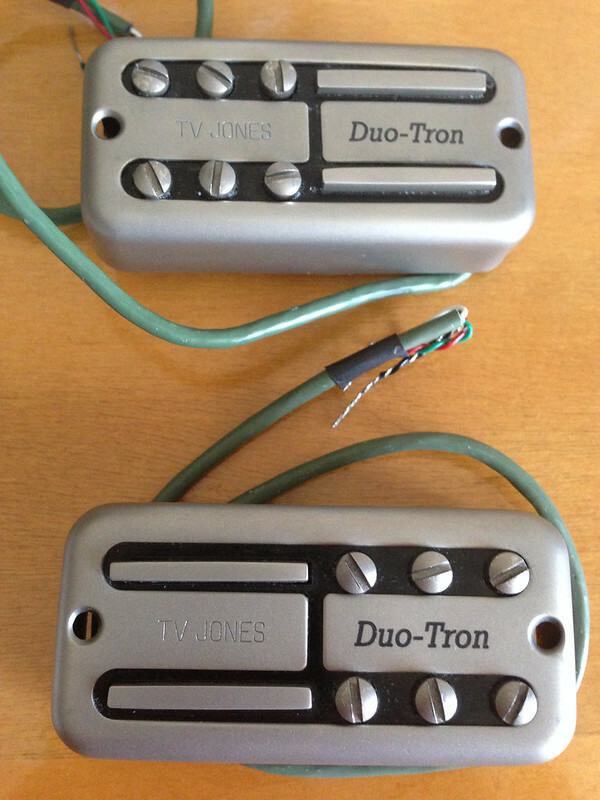 I bought the first set of sand blasted pickups. 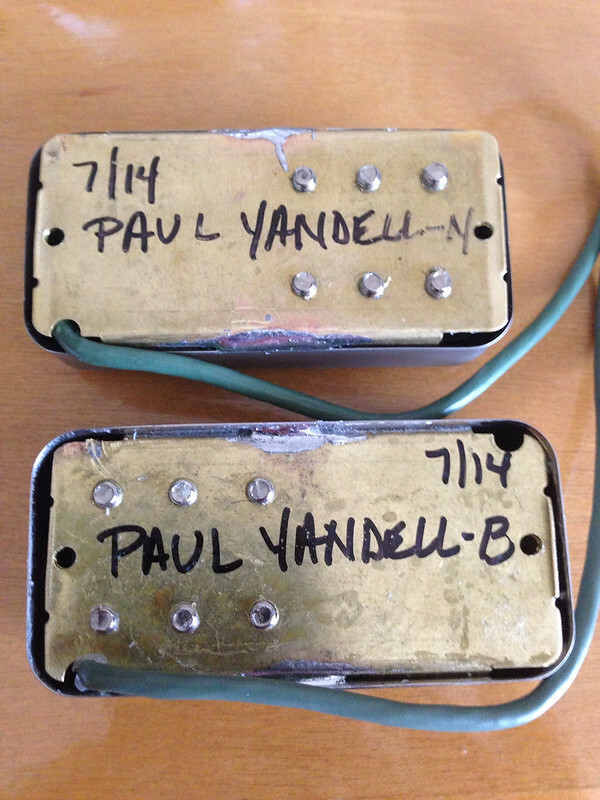 Paul Moseley was also there, and he bought the first set of chrome plated pickups, and is having TV install them in his guitar today. Anyway, thought you might like to see these first! I kinda like the sand blasted finish. That's really neat! I would love to get a new '58 model gretsch and put these pickups on there and find a phase module and install it on there as well. I wonder how those would sound on my old Warmoth Strat copy that I built back in '89. I've been thinking about a change of pickguard and pickups from the EMGs that it's had since the beginning. I'm thinking about it, but it probably won't be right away. That's awesome! They look great and I'm anxious to hear how folks like them. Did they say what the resistance values were for each p/u? Thanks for posting. That's awesome! They look great and I'm anxious to hear how folks like them. Did they say what the resistance was for each p/u? TV Jones pickups the TV Jones pick up that come on the stock country gentleman? I would imagine they meter out at around 4K like other Gretsch Filter Tron based pickups. That's part of the essential Gretsch tone. Chet claimed the bar pickup (like on the Super Tron) 'gives you more note"
In theory I would expect a clearer first and second string tone with Paul's innovation shown here. Reason being they are the thinnest and the broader magnetic field proffered by this variant would replicate the string signal more evenly. Someone have the price on these?